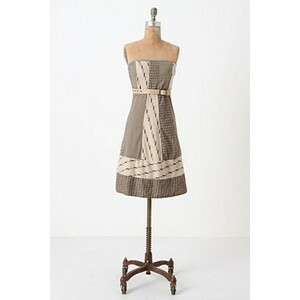 I want this dress (Walk with me from Anthropologie) soooooooo bad! The problem? They don't sell it anymore! And ebay hasn't had my size* for the past month. Even if they did, I couldn't rationalize forking over all the cash. But still. It would be cute on me, no? Larissa, that dress is totally doable for someone with sewing talent. The hardest parts of it is good fabric selection and perfect stripe matching. 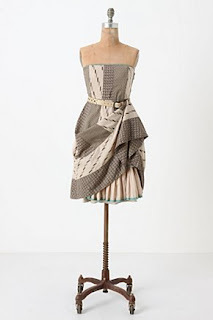 The easiest part is it's a basic dress shape with color blocking. I'm quite fond of that ruffled petticoat/slip myself. Yeah, sourcing fabric of that print quality and matching those lines so precisely are definitely that hardest parts. Sadly, my sewing isn't up to snuff. Especially since I came home with a florescent green fabric the other day. It looks adorable in the (now I realize poorly lit) store. Now? Oi. My older sis is actually a fabulous seamstress, but I feel too guilty to ever ask her to make me anything. And I never even thought of someone making me something like this until you pointed it out, Janell. Yeah, I'm so not a sewer. I can do a button. Sometimes. We could TOTALLY make that!